Congratulations to... Journal Mommy Yenny! Mommy Yenny says that she also has a year-round farmers market and that she loves to get fruits and veggies in season. 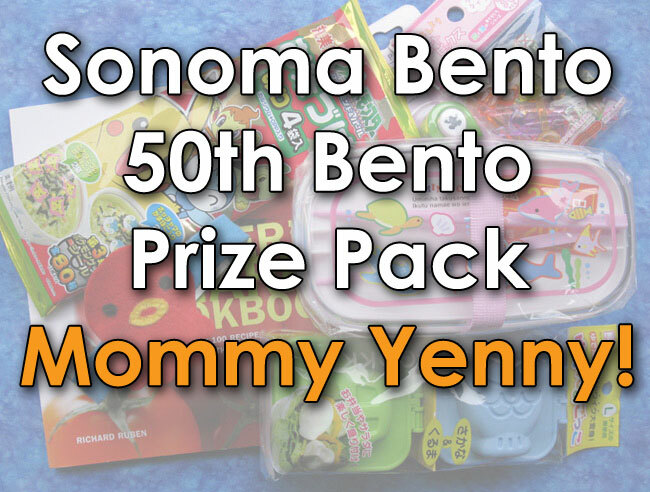 Thanks for following Sonoma Bento and I hope you like the fun prize pack I put together, Mommy Yenny! I'll be contacting you today to get your mailing information. You can visit Journal Mommy Yenny's bento blog at her site, Mommy of Twins. 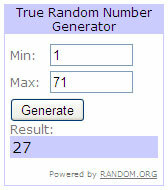 The winner was selected randomly out of 71 entries. I had to make a spreadsheet of the entries because there were a few people who did not separate their entries into different posts, and I wanted to make sure those people got the right amount of chances to win. Thanks so much to all of my followers, new and old! This was a really fun experience, especially finding out about different farmers markets and how many of us like to support local farmers and enjoy seasonal treats. With so many instances of contaminated food, it really makes sense to buy from trusted local producers. I hope you were as inspired as I was reading all of the great farmers market comments. Today's bento is hyper local! The only non-local ingredients were staples like flour, salt, pepper, and olive oil (although I can get local olive oil, I just don't have any on hand right now). This is a true Sonoma Bento. In the upper compartment: zucchini "pasta" tossed in a simple vinaigrette with few slices of okra on top (got this 'pasta' idea from bentobird), cherry tomatoes, arugula omelette, fried okra, and basil leaves. In the lower compartment: cherry tomato, a mini gala rabbit apple, steamed corn on the cob, italian sugar plums, arugula leaves, and grapes. The zucchini, arugula, and italian sugar plums are from Triple T Ranch. The egg is from Hector's Honey. The okra and basil are from a merchant at the Wednesday Night Santa Rosa Farmers Market. The cherry tomatoes are from Sebastopol's French Garden. The apple is from Ridgeview Farms in Healdsburg. The corn is from Duffy's RHS Farms. 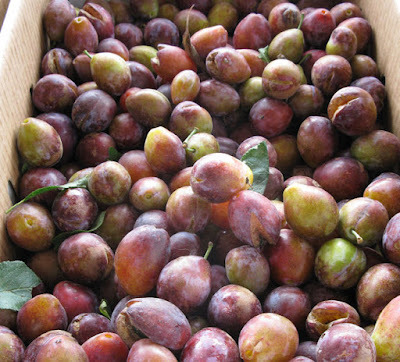 And the grapes are from Neufeld Farms. I even used local red wine vinegar in my vinaigrette from local producer Bruno Albini, and local garlic from Crescent Moon Farms. While normally I try to fit two or three local items into my bento lunches, I really wanted to highlight the fact that there is so much available here in Sonoma County that being a 'locavore' is ridiculously easy. If you have access to a farmers market, or a farm stand, a backyard garden, or even a generous neighbor with a zucchini plant, try to use these items in your lunches. You'll feel better by supporting a farmer. You can be confident that your food isn't tainted. You'll be eating seasonal foods at the peak of nutrition and taste. You will avoid the amount of gas, packaging, and preservatives it takes to bring non-local, non-seasonal food to the table. Hug a farmer! :) Or just buy his or her products. And be sure to ask for advice on how to prepare the ingredients. More than likely, she has a favorite way to prepare that ingredient. And be sure to go back and tell the farmer how it worked for you. 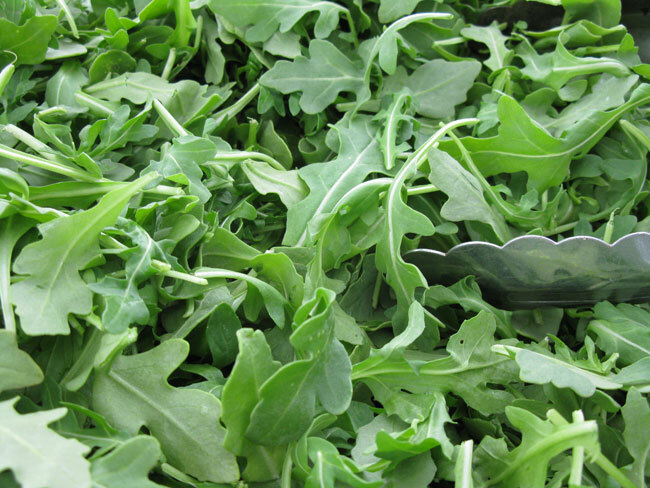 That personal interaction is what makes shopping at farmers markets so fun. 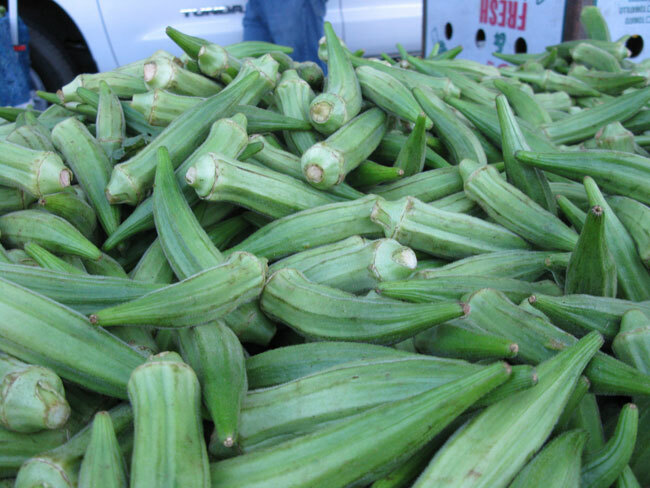 Trim okra tops and cut pods in half lengthwise. In a shallow bowl, combine egg and water. Whisk together. On a plate, combine flour, salt and pepper. On another plate, scatter panko breadcrumbs. Dip okra slices in egg wash, then in flour mixture. Redip okra in the egg wash, then roll in panko breadcrumbs. Fry okra slices in olive oil that has been preheated to medium in a small skillet. Turn okra slices to get all sides browned. Drain slices on a paper towel. Makes 6 fried okra slices, enough for 1 bento box lunch. I like to make a dipping sauce of mayo + hot sauce. Triple T Ranch makes a yummy blend called Hoppin Jalapeno. Use your favorite hot sauce. P.S. Be SURE to tune in this afternoon at 5:30pm PST to KSRO 1350AM. I will be interviewing Sheri from Happy Little Bento about bento box lunches. The interview will also be broadcast on the internet at ksro.com. Just click on the Listen Live link in the upper righthand corner. Yay for local eats!! I agree with you wholeheartedly about choosing produce from the farmers themselves. So satisfying, and you know who stands behind your food. Love that personal angle. 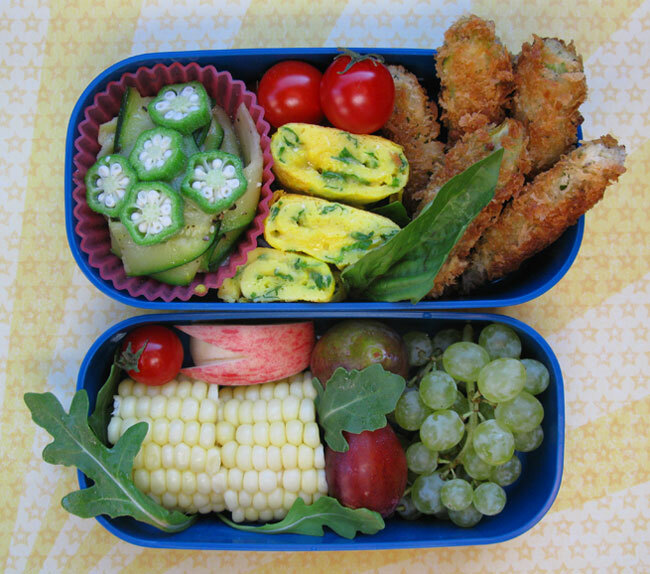 Your bento looks wholesome and fresh; and therefore delish! Go Bay Area! Thanks sheri! I hope you like the Petaluma eggs you found at your market. So scary about the giant recall going on now. They say it's up to over a half billion eggs recalled! You sounded great in our interview! Can't wait to air it this afternoon! Fried okra! Oooohlala! Must have some stat! Hi Heather! I briefly boiled the zucchini slices, then tossed them in a simple vinaigrette. It turned out very delicious. thank you so much for this wonderful giveaways! I will surely have fun with that prize pack. I have never cook okra before, so thank you for the recipe of fried okra. will try this very soon. You're welcome Journal Mommy Yenny! I got your email and address. I should be able to get the package in the mail today. :) Thanks for following my blog! Wow, what a delecatable post (and thanks for the shout-out)! A hyper-local bento is a beautiful idea, one you've realized with great style and yumminess here. I must try fried okra, esp with your recommended dip, sounds incredible! Really enjoy how you are spreading bento AND locavore love...healthful and joyous seasonal eats are rewarding in so many ways...keep up the good work, SB! !